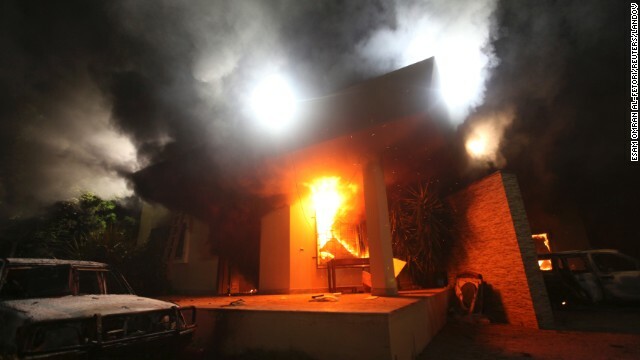 The U.S. Mission in Benghazi is engulfed in flames during the 2012 attack. The suspected mastermind is now in custody. Obama says he'll do what he wants about Iraq, authorities nab suspected American terrorists, and a teen stowaway talks about his crazy flight inside a plane wheel well. It's Thursday, and here are 5 things to know for your "New Day"
Should he stay or should he go? There's a growing chorus that Iraqi Prime Minister Nuri al-Maliki must go if there's any hope of unifying Iraq as Islamic militants take city after city, a U.S. senator said. Meanwhile, President Obama is talking about efforts to help strengthen Iraq's security forces against the threat of the militants. And while he said he'll tell Congress what he plans, he said he doesn't need Congress' approval. Right here at home: Cops nabbed two young men in Texas suspected of trying to support terrorist groups in Syria and Somalia. One was scoping out "potential recruits for committing violent jihad overseas" from his Austin home, authorities say. The other 23-year-old was caught before boarding a plane in Houston en route to provide "his services to radical groups." Analysts believe as many as 100 American citizens have traveled to fight in Syria. Like a movie: Interrogators don't expect to have it easy with Ahmed Abu Khatallah, the alleged mastermind of the 2012 attack on the U.S. Mission in Benghazi, Libya, a Washington law enforcement official told CNN. After all, he's had time to rehearse his story. But an interrogation expert thinks there's a good chance Abu Khatallah will crack, if interrogators punch the right buttons. Others have done so before him. More money, more problems: The director of the embattled Phoenix VA Health Care System is still on the government's payroll - a month after President Obama pledged to hold VA officials involved in fraudulent scheduling practices accountable. One VA official said Director Sharon Helman and two other officials at the Phoenix VA have been "removed" from their positions, but he said the government continues to pay federal employees during the termination process. And he doesn't know if the $9,000 in bonuses that Helman received last year has been paid back. Wild ride: The California teenager who defied laws and nature by surviving a plane ride to Hawaii while in a wheel well says he remembers seeing the ocean from 38,000 feet above Earth. "It was above the clouds, I could see through the little holes," Yahya Abdi, 15, of Santa Clara told CNN affiliate KPIX on Wednesday. He was hoping to see his mother in Ethiopia but ended up in Maui. Busted no more: So you've been caught reading TMZ at work. It's cool, we all have. Thankfully, Timesify is here. Just drag the Timesify button to your bookmarks. When the boss is about to catch you keeping up with the Kardashians, just click the button and the screen will look like a New York Times article -– with the text left intact! I wish that i could have "5 things to know for your new day" emailed daily. I love reading it and sometimes I forget to look at it in the morning! Either way, I love it and thank you! How cool is that? You help employees steal time away from work by explaining and posting links on how to get away with it. How amazingly unprofessional. Phoenix VA Director Sharon Helman "removed" from her position should be ordered to pay back not only the $9,000 in bonuses but her salary from the onset of the fraudulent scheduling practices. Use this money and the money of her cronies who carried out her criminal orders toward some sort of compensation to the families of the deceased veterans. And then off to federal prison they go. Deplorable and disgusting. And for plane stowaway Yahya Abdi,the angels had to be with him in the wheel well of that plane for him to be able to see the ocean from 38,000 feet above the earth through the clouds and lived to tell it. Amazing!!!!!!!! Would that be the fraudulent practices in just Phoenix or Washington state also. She is, by example, a horrible director and, by action, a horrible person. According to earlier reports, the stowaway teen was headed to see his mother in Africa, where she lives in a refugee camp in Ethiopia. Thank you for sharing. Happy #NewDay!